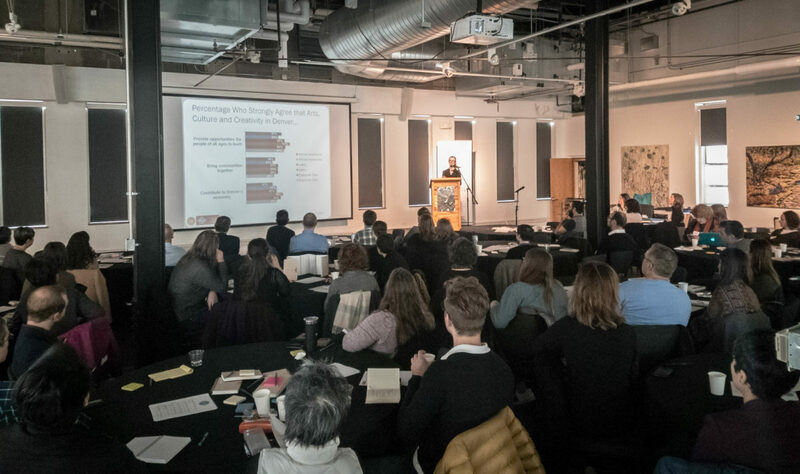 Today, Kate Darwent, PhD, spoke to an audience of over 100 arts leaders about the need to increase opportunities for Denver residents, especially African American and Latinx residents, who are hungry to participate more in arts, cultural and creative activities. The city conducted a one-of-a-kind statistically valid survey of its residents in 2017 to learn what they value about the arts, what motivates them to engage, and the barriers they face. Interestingly, residents with a strong desire to participate more face a complex web of barriers including: lack of opportunities in their immediate neighborhood, less satisfaction with the amount of information they receive, and more uncertainty about whether people like them participate in arts, culture and creativity. The 2017 survey was a mid-point check on IMAGINE 2020: Denver’s Cultural Plan.